The ambient music genre possesses many strengths, among them the willingness of so many artists to collaborate together, blending their oftentimes different styles and creating whole new directions and perspectives that had never existed before. One of the many pleasures of running a netlabel is being in a position to introduce artists to each other, to encourage a sense of community amongst them, and of course, to release the fruits of such teamwork to the world. Today, we celebrate the release of another such collaboration, this time a brilliant new work by two of the most talented musicians active today: Phillip Wilkerson and Lucette Bourdin. We confess that the mere thought of these two ambient powerhouses working together on new music had us quivering with anticipation and lofty expectations -- imagine the possibilities that could come of such a duo! Well, folks, we are very happy to report that Lucette and Phil not only cleared the bar, but vaulted clean past it into the stratosphere. Wow, what an album this is. Their new release, entitled Coast to Coast, contains a broad variety of lush and exotic electronic ambient music. Pieces with sleek and semi-rhythmic tapestries evolve dramatically into intense dynamic textural passages, and then recede again into exquisite lightness and repose. The depth and breadth of the kinds of music that these two artists have created here simply astonishes us. The music hits on all cylinders; immediately approachable, fascinatingly diverse, evocative enough for profound contemplation, and composed beautifully. This is the kind of album that listeners will want to hear again and again, just to make out all the new details that can be heard on each successive listen. Just an amazing piece of art. 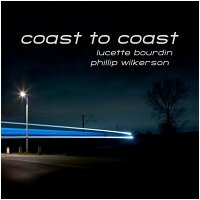 So we are deeply honored and very excited to bring to our listeners Coast to Coast, the first collaboration between Lucette Bourdin and Phillip Wilkerson. Surely among the best releases of 2011 so far, and one we strongly recommend to all of our listeners. Clearly, Lucette Bourdin is one of the most creative artists on your netlabel. I've only one word for Lucette's solo works and her collaborations with Darrell and Phillip (so far): Excellent! Would love to hear more from her and Darrell (and with Phillip). "Coast to Coast": Mindful traveling. Absolutely lovely-- a nice blend of influences, perfectly done. Check it out!